The first thing Gov. Roy Cooper did after he reported for work on Wednesday, Nov. 7, was to order up a generous new supply of red ink for his veto stamp. How do we know that? We don’t. Call it a fanciful guess. But here’s how the remarkable election of Nov. 6 – remarkable for reasons both good and not so good – has strengthened the governor’s hand in his ongoing disputes with a Republican-led General Assembly: For the first time since taking office almost two years ago, Cooper will have a good chance of seeing any vetoes he chooses to issue sustained by his fellow Democrats. True, legislative Democrats will remain in the minority in both the state House and Senate. But definitely in the House and apparently in the Senate, Democratic ranks will swell to the point where they no longer are powerless to keep vetoes from being overridden by unified Republicans. In other words, it’s a new ballgame. Cooper wasn’t on the ballot, of course. But he benefited from an upsurge of votes for Democratic candidates amounting to a rebuke of GOP legislators’ strong-arm tactics – and, plainly, of President Trump’s reliance on fear and divisiveness to stoke support for his allies. For Trump, the rallies where he conjured the specter of an invading criminal horde out of the reality of a wretched band of stragglers fleeing Central American death traps worked as intended. Except where they didn’t. Key U.S. Senate races went to Republicans for whom the president campaigned – enough to bolster his party’s margin of Senate control. That especially has implications for appointments to the federal bench where Trump has sought to put a conservative stamp. On the House side, however, many Republican members found themselves defending metropolitan-area districts with large contingents of the kind of voters who view Trump as something between a narcissistic boor and an authoritarian threat to American democracy. When the dust settled, Democrats had won enough seats to gain House control for the first time in a decade. At the least, that should mean closer scrutiny of Trump’s own conduct — perhaps even beyond the ground being covered by Special Counsel Robert Mueller – and of policies that are disrupting the nation’s alliances, undercutting its moral leadership and threatening the environment, among other ill effects. So how many of North Carolina’s 13 congressional seats were captured by Democrats as the party’s prospects brightened? A grand total of three – the same paltry number they’d had before. Incumbent Reps. G.K. Butterfield of Wilson, David Price of Chapel Hill and Alma Adams of Greensboro all won by crushing margins. But elsewhere, even in a few districts where Democrats seemed to have a decent chance to win, Republicans such as incumbents George Holding of Raleigh and Ted Budd of Davie County managed to hold off their challengers. The pattern showcased yet again the power of Republican gerrymandering, which has packed Democratic-leaning voters into three districts drawn so that in effect they are thrown to the wolves. Republicans claim the rest even though overall vote totals typically are nowhere near as lopsided in their favor. That’s just what happened this time. The News & Observer of Raleigh calculated that across the state, GOP candidates for Congress garnered 50.3 percent of the vote versus Democratic candidates’ 48.4 percent — yet they took 77 percent of the seats. With Trump filling more federal judgeships, legal challenges to Republican gerrymanders – challenges that have gotten traction in recent years – may hit a wall. There’s hope, however, that North Carolina’s own courts may be ready to stand up more strongly for voting rights. Anita Earls, a leading civil rights attorney, handily defeated Republican incumbent Barbara Jackson to claim a state Supreme Court seat. (The presence of candidate Chris Anglin, who ran as a Republican despite the party’s hypocritical efforts to keep him off the ballot, worked in Earls’ favor.) The outcome was a milestone that the N.C. Council of Churches and all advocates for social justice – the cause to which Earls has devoted herself in recent years – can salute. With Earls’ victory, Democrats will have a 5-2 majority on the high court. The justices must of course make independence from partisan pressures a top priority. Earls in that regard can be expected to set a good example, reconciling her commitment to constitutional principles of equal opportunity with her declared intention to follow the law wherever it leads. The legislature, ever since Cooper’s election in 2016, has been determined to clip his wings, especially with regard to his powers of appointment – not only to positions within the executive branch but also to judgeships. Bear in mind that while judges normally are chosen at the polls, governors long have had the authority to fill vacancies created when a judge leaves office prior to the expiration of his or her term. Bear in mind also that the courts, even with conservative winds gusting, have offered the most effective resistance to Republican legislators’ encroachment on traditional and appropriate executive powers. Governors value their ability to appoint judges not only because it serves their political purposes, rewarding loyal allies, but also because it gives them a better chance to prevail when tricky questions arise with regard to their authority. It’s natural for a governor to pick a well-qualified candidate who looks to be on the same page politically and philosophically. With those factors in mind, legislators sought to amend the state constitution in ways that would have given them a major role in filling vacant judgeships – a way to tilt the courts to their liking. The proposed amendment was one of six crammed onto the Nov. 6 ballot in a legislative flurry last June. None of them passed the basic standard for constitutional changes, which is why the Council of Churches stood in opposition to the entire slate. They weren’t necessary to serve the interests of justice. Nor were they carefully and openly developed, or clearly and fully explained so voters understood what they were being asked to approve. The good news is that the judicial vacancy amendment, along with another misbegotten proposal that would have gummed up the state’s oversight of elections, crashed in defeat. The other four, however, got over the bar – despite solid opposition in urban counties such as Wake and Durham. Especially troubling is that a requirement for in-person voters to show a photo ID is now baked into the state constitution. That’s long been a Republican dream, since Democratic-leaning voters are more likely to lack such an ID or have trouble getting one. What remains to be settled is how strict the rule will be. We’ll find out when the legislature convenes on Nov. 27 for a lame-duck session. If a previous attempt to impose such a rule is a guide – an attempt that was nixed in federal court – voter suppression will continue to be the theme song. And with Republicans holding their supermajorities until January, Cooper will be able to do precious little to make the rule one that reasonable people can live with. 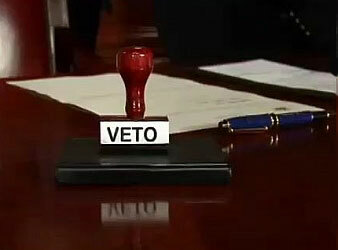 The potential for lame-duck mischief hatched by Republican chiefs savoring their last veto-proof weeks is high. Let’s hope their election setbacks – with many voters disgusted at ongoing power-grabs — convince them to exercise restraint. Come the new year, Cooper’s veto stamp will give him and his fellow Democrats leverage to help shape the agenda and to block some bills that deserve to be blocked – perhaps ones that cut polluters too much slack or that continue to undermine the public schools. It shapes up as a true test of the governor’s values, judgment and political skills. Another version of that test will play out in Washington, as House Democrats take control and try to mount an effective counterbalance to Trump and his Senate enablers. The nation will be well-served if they hold him more closely to account – yet they have to be careful not to overdo it, lest Trump manage to portray himself as some kind of victim and boost his chances for a second term. Republicans in the election just past, despite their Senate victories, paid a steep price for the president’s toxic rhetoric, his callousness toward women’s concerns, his demonization of immigrants, his cozying up to foreign despots, his exploitation of his office for personal gain. Many Americans – including the North Carolina voters who turned out to send him a harsh message — know the country deserves better. Our ideals of justice, compassion, equal opportunity and moral leadership demand it.